Squishy, squashy, colourful and fun! Creating with play dough, or modelling clay—is still an activity that children of enjoy in the age of iPads and game consoles. Just what is it about this versatile classic that captures the imagination of kids of all ages? Like the thrill of flying through the air on a trampoline, we think that it's simply the thrill of moulding something that you can be proud of that draws kids' attention to play dough. Not only fun, this creative element of play dough is a valuable development tool and learning exercise. 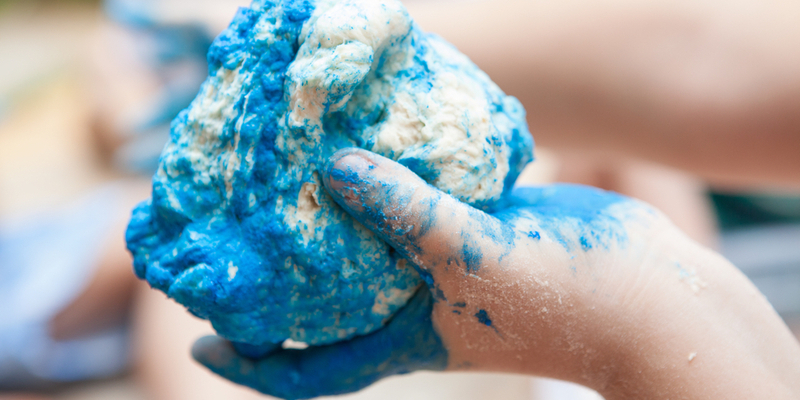 We have an easy-to-make, non-toxic play dough recipe that you and the kids can whip up at home. You can even get building on your trampoline mat, along with some crayons, to create a little city. 4 drops of natural food colouring. Combine the flour and salt in a large bowl. Mix the warm water and food colouring in a separate bowl. Pour the coloured water mixture into the flour mixture, slowly, stirring as you go. Mix until all is combined. Remove the mixture from the bowl, and knead until all the flour is absorbed. Tip: If the dough is sticky, add a touch more flour until it reaches the desired consistency. Playing with play dough is therapeutic for a lot of children. You’ll notice that once your child begins moulding and shaping, they will quieten and focus. This relaxing activity will relieve any pent up energy, and it's particularly helpful in calming groups of children at birthday parties or play dates. Even from the age of two—when your child may only squish and squeeze the play dough, without creating actual models—their motor skills and dexterity are being exercised. As children learn how to roll, flatten and build, these skills will continue to improve. It encourages planning and problem solving! From the moment your child begins to workshop which shapes, animals or creative models that they want to create, they are developing important imaginative and problem solving skills. This ability to make a plan and execute it, overcoming any obstacles along the way, may seem frivolous in the realm of play dough, but is invaluable when applied to future life situations. Looking for a spot in the home that can handle some messy play dough fun? You only have to take a step outside to your backyard Vuly trampoline! The cleanable and durable mat is the perfect surface for a group play dough session. Bring on some crayons and make a town with roads! A hose down, gentle scrub and pat dry at the end of play is all that you need to do to have it ready for next time. How do your kids get creative with play dough? We’d love to see their latest creations!